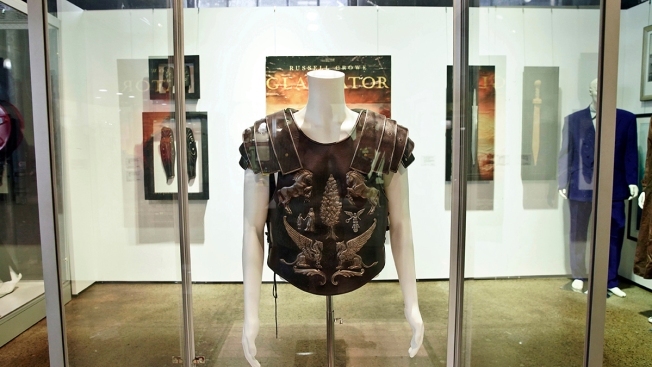 One of the costumes from the film "Gladiator" owned by actor Russell Crowe is on display to be auctioned by Sotheby's auction house as part of the 'Russell Crowe: The Art of Divorce Auction' at Carriageworks, Sydney, Australia Saturday, April 7, 2018. A 128-year-old Italian violin that Russell Crowe learned to play in a few months before he starred in the 19th century war drama "Master and Commander" stole the show among movie memorabilia on offer at the Oscar-winning actor's auction on Saturday. The rare instrument by Leandro Bislach sold for 135,000 Australian dollars ($104,000), the highest price for movie-related offerings among 227 lots up for sale in Sydney as part of the Australia-based New Zealander's divorce settlement. More surprisingly, a costume that Crowe wore in the same 2003 movie wasn't far behind, raking in AU$115,000. While the violin was close to the top of Sotheby Australia's valuation, the winning bid for character Captain Jack Aubrey's dress uniform exceeded the auctioneer's hopes by AU$80,000. The violin's price was only exceeded by a painting from Crowe's extensive collection by Australian artist Brett Whiteley, "Moreton Bay Fig and Palms," which sold for AU$190,000. The auction, titled "The Art of Divorce," took place on the actor's 54th birthday and the anniversary of his wedding to singer Danielle Spencer in 2003. Immediately afterward, the violin— which Crowe described as "a lot very close to my heart" — became the 31st item to go under the hammer. Before the auction, Sotheby's predicted the eclectic offerings, covering movies, guitars, art, watches, sporting memorabilia and Crowe's jewelry gifts to Spencer, would bring between AU$2.6 million and AU$3.7 million. The official final sum was not immediately available after the auction, which took more than five hours. Bidders' interest had been expected to focus on the violin and paraphernalia from "Gladiator," the 2000 blockbuster that earned Crowe his Academy Award for Best Actor. Demand for movie memorabilia often overwhelmed expectations. Crowe's torso armor, expected to fetch up to AU$30,000, sold for AU$125,000. A replica Roman chariot, thought to be worth up to AU$10,000, was sold for AU$65,000. Sotheby's was closer to the mark in valuing the maroon Doc Martens boots Crowe wore as the skinhead Hando in the 1992 movie "Romper Stomper." The pair sold for AU$10,000, while Sotheby's had anticipated between AU$10,000 and AU$15,000. But some lots failed to reach reserve, including a 2008 custom motorcycle built by California's Orange County Choppers that was turned in on a bid for AU$35,000. It's painted a distinctive green and red, the colors of the South Sydney Rabbitohs, the Australian Rugby League team that Crowe part-owns.